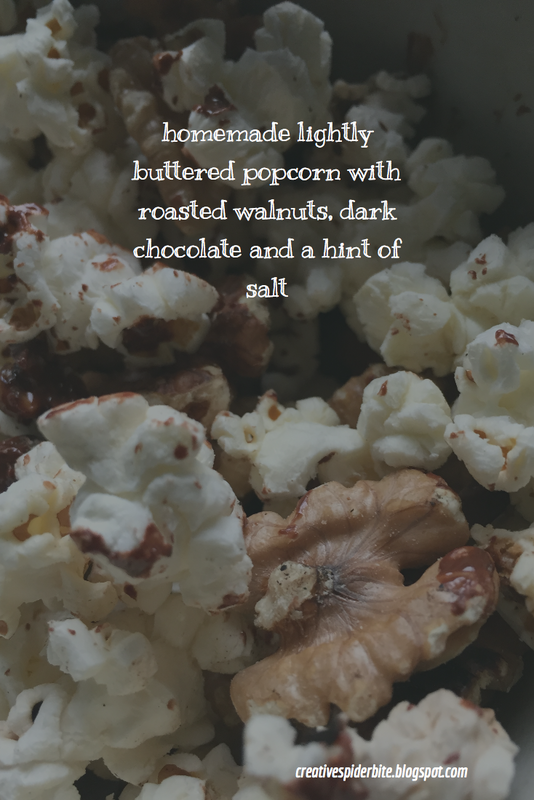 Bitten by that creative Spider: Waste Free Homemade Popcorn for Movie Nights with a film review from "The inner Circle"
There is no better and more variable movie snack than popcorn, right? It is a well known fact that it is healthier than crisps and depending on what you add it has less calories, too. It is so simple to make, and if you pop it under a glass lid, the kids (and actually quite a few grownups of all ages, that includes my MIL with over 70) will love watching and get very excited when it starts popping and shortly after a mass explosion of popping popcorn starts under your lid. There are endless variations you can make. Traditionally people are split into two camps when it comes to seasoning. Salt or sugar! I prefer them salty with a hint of butter taste. I think it is because that is what I grew up with. My husband likes them sweet, and if you add the sugar while they are still in the hot pan it will slightly caramelise. I have seen popcorn made with marshmallows, chocolate and caramel which sounds divine. I have also tried them with salt, black pepper and herbs d´Provence. I could also imagine if you add some fresh ground parmesan cheese it will make them even tastier, but you might need to add a few napkins. Something I am going to try today for you is with roasted walnuts, dark chocolate and a hint of salt. But I want to make them in the microwave and show you that you don't need to buy the overpriced individual plastic wrapped paper bags, but all you need is a musli dish and saucer, both microwave proof and some corn for popcorn making. And you can get them made just as fast, with less waste and for 13 Cents per portion plus seasoning! That´s the non-GMO one. A bag of 500 grams of dried corn can be got for under a Euro, if you want organic non-GMO corn (which makes a lot of sense in my humble opinion) you can get it for under 2 € over here in Europe. So you won't just safe the environment a little, but also your wallet will have a better padding. You see making them yourself has many advantages. If you say you like the microwavable version better, as you don't need to clean up a pan afterwards, well I had a light bulb above my head moment, when chatting with Michael on Facebook the other night. And I had to try it right away. All you need is a microwave safe cereal bowl and a saucer that sits on the cereal bowl. Fill in roughly 20-25 grams corn suitable for popcorn to get a full cereal bowl of popcorn. No fat needed. And yes that looks very little in the bowl, but trust me you will have a full bowl of popcorn in the end! Put your saucer on top of the bowl with the bottom side facing down, to give it a better hold. Set the microwave on high and the timer on 3 and a half minutes. And start listening for the popping sound. Even the best microwavable dish will be super hot after this. But the corn needs a high temperature to pop. And while I have never tried it, I can't imagine the bag not being very hot if you buy the popcorn for microwaving in the individual bags? I would let it cool down for a few minutes and then remove it from the microwave. Make sure you don't burn your fingers! Now season with what ever you like. The first lot I made for my husband with cinnamon sugar and for me with a hint of salt. The second batch I made, as mentioned above with in butter roasted walnuts, some dark chocolate and a pinch of salt. The dark chocolate was one of those with orange zest. It just made them that extra bit divine. Melt a teaspoon of butter for 15-30 secs in the microwave. Take the bowl out, and add 20 grams of corn and stir well. Put your saucer on the bowl, bottom side down! Put it in the microwave and set on high for 3,5 minutes. In the mean time, roast walnuts without any fat in a hot pan while stirring or shaking the pan quite often, be aware nut can burn pretty fast. Also chop a 15-25 grams of dark chocolate (with orange zests if you like!) Once the microwave rings, open the door and let it cool down a little. Grab the bowl with oven mittens and take it out, and carefully remove the saucer (while still wearing your mittens!) and add the roasted walnuts and chopped chocolate and a good pinch of salt. Stir well and serve. The chocolate will melt, so you might want to serve them with napkins at hand, especially if little fingers are involved in the eating process! I hope you can enjoy one of Michaels great movie recommendations with some homemade popcorn next movie night. I can only say that my list of must watch movies has gotten pretty long since I follow his blog! So here is the 100th review from the inner circle! You can read it here, or head over to "The Inner Circle and drop Michael a comment! So tonight the cheetah and I trying something new to us…we are hosting a Eco-friendly blogger that likes making food from scratch as it is environmentally friendlier (less waste) and very often healthier as no additives and in most cases it also happens to be cheaper.. named Pat,A Irish lass who is going to share a quick,fun and tasty treat to go with watching a movie. We spent a couple of weeks trying to figure out how to make this work and we decided a co-blog entry is the way to go. In the small city of Lawrencetown,Washington Sally Aurora “Roe” Teagarden is a young woman who works as a librarian. She manages her mother Aida’s townhouses on the side. Aida,who happens to be a very successful real estate agent,is always trying to get Roe in a relationship or to improve her style sense. Roe,on the other hand,enjoys spending time with her Real Murder club where the different members try and come up with proper deductions on old cold cases. The local election for the President of the club is coming and Roe is the co-favorite along with John Queensland. After Roe makes a good case for the wife to a killer of a old case,an elderly woman named Jane compliments Roe and says she sees a lot of herself in Roe. Roe knows that Jane is a elderly spinster who used to be the head librarian and she doesn’t know how to take the comparison. Jane asks Roe to come over to Jane’s home the next day and Roe agrees. Jane leaves and then we meet Sally Allison who is Roe’s best friend and a local journalist and police detective and former boyfriend of Roe,Arthur Smith. Arthur quit coming to Club meetings when he became engaged to follow detective Lynn Liggett. Roe and Arthur are still friends but they broke up because there was no chemistry between them (but I think Arthur feels a little differently. Roe visits Jane the next day and they have a friendly chat. Jane gifts Roe a book and pats a seat telling Roe she always did her best thinking there. Jane has also set up Roe with a date with her pastor,Father Scott Aubrey,the two women chat some more…. The next day Sally tells Roe that Jane is dead,she died from heart failure. At Jane’s funeral her lawyer,Bubba Rankhart,approaches Roe and tells her that Jane has left her entire estate to Roe. Roe is shocked as Jane and her were friends but not close. Rankhart says Jane thought highly of Roe. He gives Roe Jane’s house keys. When Sally comes over to see what is going,Roe says she has a new house and she is going to look at it. But when Roe is surprised by an intruder who has broken into the house,the mystery starts as Roe tries to figure out what the thief was looking for. The cops,led by Arthur,come by but can only tell Roe that other break-ins have been happening. Roe notices that only large cupboards and drawers have been opened,she deduces that something large is the target. As she ponders this later that day alone,she remembers was Jane said about her favorite seat,when Roe opens it up,a skull with a piece is sitting at the bottom. Roe confides in Sally what she seen and the two friends begin poking around,Roe figures that Jane must have dug up the skull nearby and that means a body has been buried and the killer wants to find the skull. Roe and Sally discover quite a few people have gone missing from Roe’s street and the hunt is on to discover who is missing and when they do find the body that the skull belongs to,it opens up a whole new can of worms as Arthur and Lynn (who doesn’t like Roe) have bought the house across from Roe’s new home. With Sally urging her to go to the cops,another break-in and a budding romance all crowding her plate,can Roe survive long enough to solve this puzzling murder??? The Aurora Teagarden mystery series is written by a writer named Charlaine Harris. :A Bone to Pick” while actually the second in the book series is the debut film in the Hallmark Channel movies. Being that they are Hallmark,the violence is toned WAAAAY down and is it actually more designed and written as a “whodunit” more then a “shoot ’em up”. Did we like “A Bone To Pick”? Oh yeah we did!!! This movie is so much fun and quite a hoot to watch. Hallmark Channel has a real flair when they cast their movies and this series is no different. Candace Cameron Bure,who rose to fame in “Full House” and “Fuller House” is perfect as Aurora Teagarden other then her height (she is 4’11 in the books). She pretty,spunky and has a sharp inquiring mind for puzzles. She has great chemistry with both Marilu Henner (Brooklyn Nine-Nine) ,who plays her mother Aida who is always looking to get Roe hooked up and the beautiful Lexa Doig (Arrow) who is spot on as Sally,her well meaning best friend who is always trying to get Roe to use her common sense. Miranda Frigon as Lynn Liggett,Roe’s thorn in the side is tough but has a growing respect for Roe’s ability to detect and Peter Benson is charming as Roe’s ex-Arthur. Hallmark has turned six of the novels into movies so far,I have found two of them and I like to get the other four. Director Martin Wood does a fine job in making sure there is a quick pace and still gives his stars plenty of room to shine. He has worked extensively in TV and nows his away from a TV movie and this being a Hallmark movie,there very little actual violence. Wood knows what the average Hallmark Channel viewer likes and he delivers a very neat and tidy movie. The cheetah and I give “A Bone To Pick a thumbs/paws up. “A Bone to Pick” is a made for TV movie and should be rated PG. It has a run time of 86 minutes and has no special features. It does have one charming product placement but you’ll have to spot that one yourself. This is a cool idea to recomend the snack to the film. You both should do this more often. 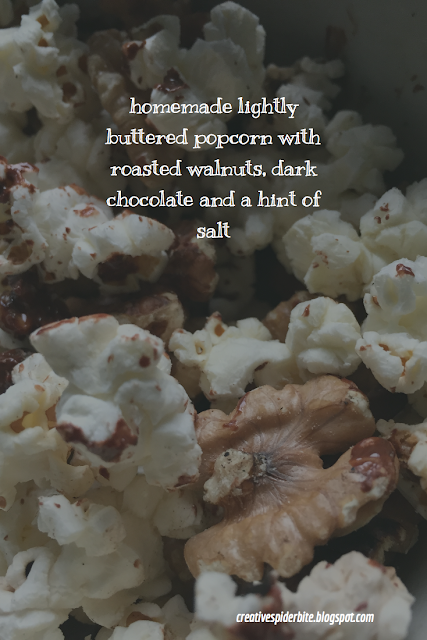 The popcorn recipe with the chocolate and roasted walnuts make my mouth water. Unfortunately I don't own a microwave.